MAV SpA of Italy have more than 20 years exposure to the field of manufacture & marketing of Clamping units, Shrink Disc & Rigid Couplings – all based on 2 tapers sliding on each other to provide necessary power transmission between shaft/component or between 2 shafts. MAV Rigid Couplings Model 1004 & 1204 offer light & medium duty Rigid couplings to connect shafts of the same diameter. Specials - to connect 2 shafts of different diameters, Stainless Steel construction can also be catered to. TRADELINK SERVICES now offers RULAND Rigid shaft couplings in one and two-piece designs, with and without keyways, in aluminum, carbon steel, and stainless steel. A large number of standard sizes are available in straight and step bore combinations to fit shafts ranging from 1/8" to 2" in the inch series and from 3mm to 50mm in the metric series. The one-piece rigid coupling wraps around the shaft, providing high torsional holding power without damage to the shaft or fretting. The two-piece rigid coupling has the additional benefit of easy fitment, without disturbing other components – apart from easy dynamic balancing. All bores in the Ruland rigid couplings are precision honed, enhancing the overall performance of the coupling, resulting in a round, precisely sized bore. 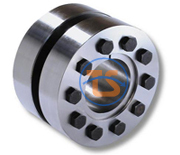 This also helps in increase area of shaft contact and higher transmission capacity. Rigid couplings come with Ruland's unique Nypatch® socket head cap screws for increased performance and reliability. Nypatch® is a proprietary process that involves depositing a 360 degree coating of Nylon on several threads of the socket head cap screws. This coating is designed to reduce screw vibration, during the course of normal use. 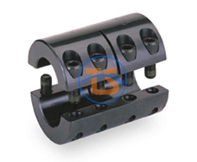 The benefits of using rigid shaft couplings include their economy, high torque capacity, and zero backlash. 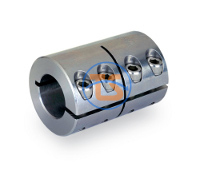 Rigid couplings are suitable for applications when misalignment is neither present nor desired, including connecting line-shafting or attaching a motor to a gearbox. 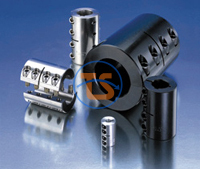 Rigid couplings are increasingly used in precision motion control applications where components are properly aligned.